BREAKING NEWS – the Forest Glen & Montgomery Hills Master Plan Revamp – redeveloping a community nestled between DTSS and Wheaton – A TWO PART Series. 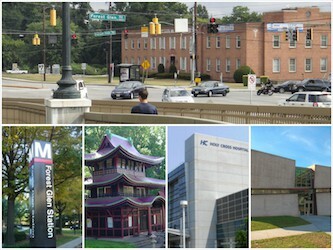 By integrating the Montgomery Hills Commercial District with the Forest Glen Master Plan, the consolidation could create a sense of community between the two areas currently divided by Georgia Ave and the Beltway Pedestrian Bridge. 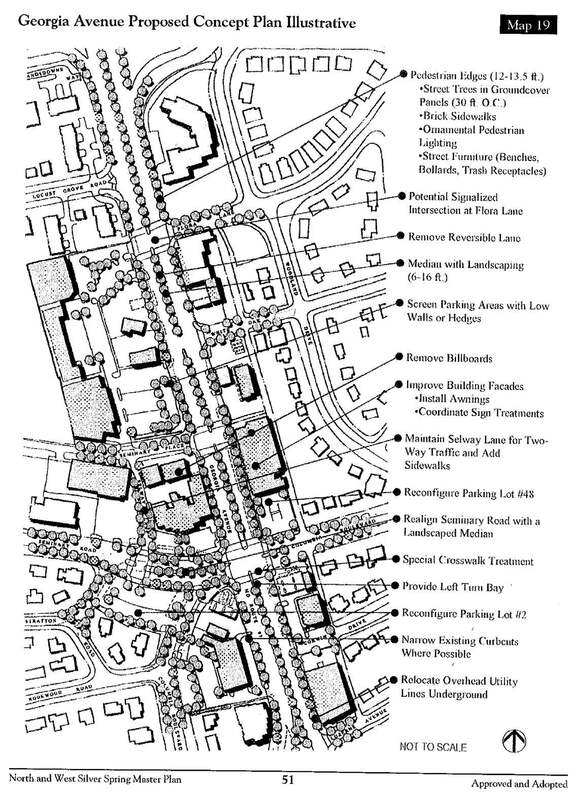 Although this isn’t the first time Georgia Ave has been considered for redevelopment, it is interesting that MoCo is consolidating both of these projects given how their respective plans could drastically change the area. Located on roughly 18 acres along Georgia Ave between I-495 and 16th Street, Montgomery Hills is an older commercial district that has been plagued with many traffic issues and limited commercial/office development. Major retailers include the CVS, Staples and the Sniders Superfoods Market – a grocery store that caters to its local customer base. Other smaller businesses such as Woodside Deli and Goldberg’s New York Bagels have a large local and dedicated fan base and are likely to benefit from such a revamp. Additionally, given the large amount of surface parking lot space, it is foreseeable that any new developer could utilize this area as a mixed use development or bring more well known anchors with its proximity to the metro and Holy Cross hospital. 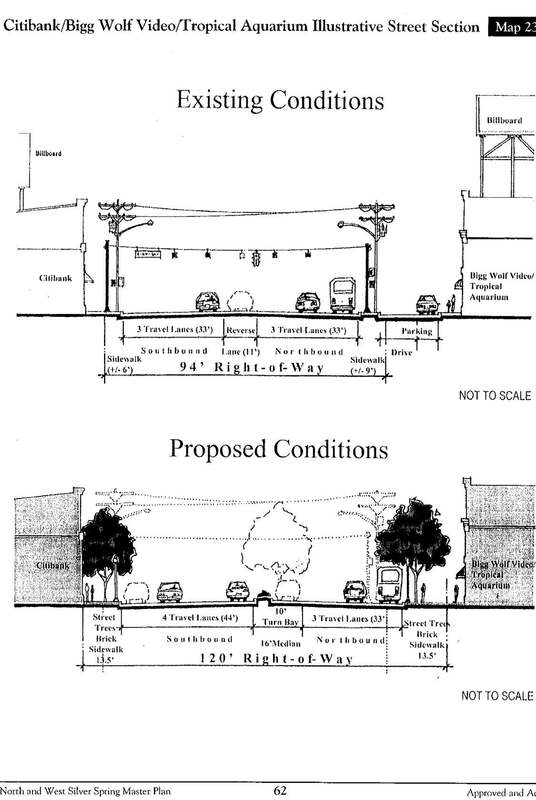 Although the Montgomery Hills Master Plan doesn’t address traffic issues per se (Maryland State Highway has jurisdiction over Georgia Ave), some of these changes could be a boon to revitalize this aged commercial area. 1) Relocating Utility lines underground (this is huge given what a eye sore some of these power lines can be). 2) Adding ornamental pedestrian lighting and street furnishings, and brick sidewalks (like some of the small village centers you see in Bethesda). 3) Creating large medians with landscaping on Georgia Ave (this area is in great need of more greenery). 4) Extensive reconfiguring of parking lots with additional landscaping (ensuring better use of space). 6) Special crosswalk treatments (to promote better access from FG and surrounding neighborhoods). 7) A possible consolidation of the Montgomery Hills Car Wash with the Shell Gas Station (anyone who has spent much time on this stretch of Georgia Ave. knows how the traffic gets clogged because of the car wash!). Recognizing that this portion of Georgia Ave will always be busy (as a link to I-495 and 16th street), restructuring Montgomery Hills could connect communities like Forest Glen with Woodside Park and other neighborhoods. With Montgomery County Council approval scheduled for February 2018, we could see a new Montgomery Hills/Forest Glen Consolidated area by 2020! Exciting times for Forest Glen – stay tuned for Part 2 of this series next week covering the changes that will affect the Forest Glen Master Plan! It would be amazing to see this kind of redevelopment here! Thanks for writing about it! Thanks Matt! We are definitely excited about the development too! Since that 2014 bizjournal article on a RFP for Forest Glen, I haven’t been able to find anything on how that progressed (or went forward at all?!) I’m very curious as to how that is going to come together…. The last I heard was that details of the proposed development would be coming soon. Check here for updates as they become available – we hope to get some news from WMATA soon!